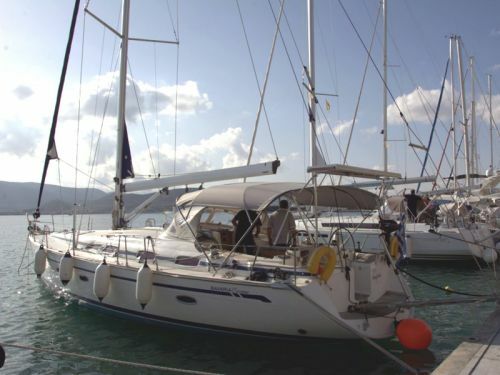 Looking to sail from Skiathos? Search to find and book your ideal boat, or read everything you need to know: prevailing winds, where to sail, how to get there and more! Skiathos has such incredible scenery and weather that it's a major tourist island for landlubbers, but it's also a phenomenal place to sail from. You can join the crowds by slickly mooring your yacht just off the heaving beaches, or completely escape them by heading off to nearby Skopelos (where Mamma Mia was filmed, and which is, incredibly, even more beautiful than Skiathos!) or further afield to the quiet fishing village of Patitiri or the super remote anchorage at Kira Panagia, where you'll share the bay with dolphins and seals. There's almost always glorious sunshine from May to October, reliable winds, and it's easy to explore the rest of the Sporades from here - which makes it the perfect starting point for your sailing holiday! Skaithos is a brilliant starting point for discovering the Sporades islands – and there is much to discover: from the vibrant town of Skiathos itself, the majestic and magnificent town of Skopelos, the seals and dolphins of Peristera, the super-remote monasteries of the Northern Sporades, and all the beaches, bays, cliffs and tavernas along the way. It’s also possible to sail out to Skyros, which has its own species of horse, or to head to the mainland and Volos, home of the legendary centaurs. The nearby beach is most famous for its appearance in the recent Mamma Mia film, but this village has a killer sunset, and, if you climb the hill, amazing views over the Sporades. An outstandingly beautiful Greek fishing village with white-washed buildings making the harbour area a giant amphitheatre, splendid architecture, and a maze of narrow streets and squares you could easily get lost in. Life moves at a different pace here! At the heart of the Alonissos national marine park, this remote anchorage in a quiet bay of an unspoilt island is a tranquil place to sail and anchor. Keep a look out for dolphins, seals and sea-turtles. There are 14 islands which make up the Sporades islands, including Skiathos, Skopelos and Skyros. It would be great to sail around them all inside a week, but given the distances involved, it’s simply impossible, unless you sail all day, every day, from dusk till dawn. And that would leave little or no time for exploring the villages, beaches, bays, cliffs, monasteries, tavernas and bars along the way, and it wouldn’t feel like much of a holiday! Our suggested six-day itinerary instead focusses on hitting the best islands within easy reach of Skiathos, and offers a mix of big and small villages, remote anchorages, beaches and hillsides. It’s only six days because it’s likely that, after checking in and getting everything sorted for a week away at sea, there won’t be much time to get the sails up and make way to a destination. It’s better to rest up and enjoy Skiathos for the night, and we’ll set sail first thing on Sunday morning. 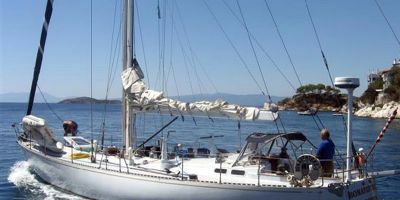 You’ll need to return the boat to Skiathos on Friday night (to make sure that it can be ready in time for the next group of holidaymakers) so you won’t be able to sail on the day you check-out either. 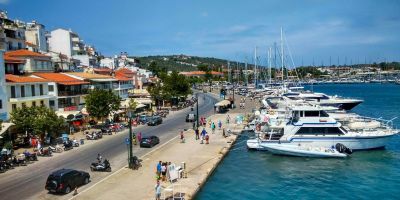 Incidentally, if you’re thinking of heading back to the mainland instead of this route, you can check out our destination guide for Volos, which includes a number of stops along the way to Skiathos. Here we go! 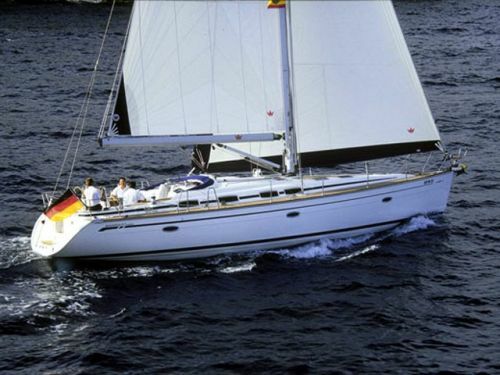 Whether you’re a regular sailor, or if this is likely to be your only time on a yacht this year, welcome aboard. Get everyone on-board, with all your provisions, and then let’s slip the lines and get out of here. If you look to your port side as you leave Skiathos marina, it possible to see our destination in the distance on the nearest island because it’s only a few miles away in a straight line – however, we’re on a sailing holiday, and we want to get some sailing in and get to grips with the boat, so we’re going the long way around, basically circumnavigating the whole island of Skiathos. We’ll start by heading South-west, keeping the coast on your starboard side, as we work our way round. As well as practicing sailing at pretty much all the points of sail, you’ll be able to get more of an idea about what Skiathos is all about. You’ll pass a multitude of beaches, including the ever-popular Koukounaries beach on the South-west, the party beach of Big banana beach and the neighbouring nudist Little banana beach on the West coast, and the beautiful Lalaria beach on the North of the island. Stop a while at one of the smaller beaches if you fancy, or if things are getting hot. From Lalaria beach, we’re going to hop across due East to Skopelos island, and the small fishing village of Loutraki. Loutraki is a beautiful little village, and the local beach was made famous by being the shooting location for the recent Mamma Mia film. There’s a couple of tavernas here (or more up the hill in the nearby village of Glossa), but the best thing to do here is to settle down and watch the sun setting over the island of Skiathos. Glorious. After enjoying the delights of Loutraki beach and the small-village feel of the place, we’re heading to the capital and namesake of Skopelos island. People have been living in Skopelos Town for thousands of years, and, thanks to its strategic location, it has grown into a magnificent and elegant town which is a joy to stroll around and explore. From the sea, it looks idyllic, with classic white-washed houses, an abundance of greenery, and narrow dusty roads making the town look about as Greek as they come. To get there, we’re sailing North from Loutraki to the northernmost tip of Skopelos island, likely reaching against the prevailing wind. Once you’re round the top of the island, it’s a single tack and a broad reach to follow the coastline South-east to Skopelos Town, which you’ll find nestled in the bottom half of the island. One the way you’ll pass plenty enough bays and beaches, which might be worth a look – the most popular are Agios Ioannis and Glysteri. Pulling into Skopelos Town might well be the highlight of your trip, with the town surrounding the marina like a giant amphitheatre, so get your camera handy. Now is also a good time to try to remember to take a group shot of your crew! Once focussed on fishing and growing vines and olives, nowadays, Skopelos is principally a tourist town, with people flocking here from around the world, and some arguing that it is the most beautiful island in the Mediterranean. 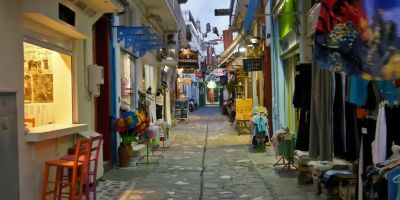 That said, it attracts a different crowd to those in Skiathos, and you’ll find it a relaxing place to be, and it’s said that people actually walk slower here. There’s a good range of shops and services, and it’s worth stocking up because we’re going remote for the next couple of days. The trip from Skopelos to Kira Panagia is the longest leg on this itinerary at 24 nautical miles, but it will feel like you have gone to another planet. We’re leaving man-made beauty and civilisation to head to an anchorage on a remote and unspoilt island. There’s no shops there, so make sure you have plenty of food and drink to see you through the night. From Skopelos, we’re heading north-east, into the prevailing wind, and basically sailing along the length of the West side of Alonissos island, then onwards to Kira Panagia. You should be beating your way up the wind, and by the end of the day you should have a well-trained crew, and you’ll understand the boat so much that you’ll be communicating about tacks by just nodding at each other. The best and most sheltered anchorage on the island of Kira Panagia is on the North of the island, where there’s a narrow channel that leads into a large bay area, which has plenty of space for throwing down the anchor, and good holding conditions. Pay attention to your charts and plotter when sailing the narrow channel inwards as there are some shallow reefs along one side. Kira Panagia is part of the Alonissos national marine park, and it is a very tranquil place to rest awhile. The only building on the whole island is a monastery. It was originally built in the 16th century and renovated in 2017, but there has been something on that site for much longer (there are graves outside which date back to 500 AD), and there are a couple of signs that a couple of Roman and ancient Greek buildings were once built on the island. Are you bored of the sound of silence yet? We’re going to head somewhere with a little more life (but not too much). From Kira Panagia, head Northwards back out of the bay, then due East. If you’ve gotten a taste for remote churches and monasteries, then you’re in luck – you’ll also find them on nearby Gioura and Pappous, and you’ll score double points if you dig out the binoculars and spot them both. From the bay on the South of Gioura, head South-west and head around the south side of Kira Panagia, enjoying the wilderness of it all. Continue South-west, running with the prevailing wind, to the Eastern side of Alonissos, and our destination, Kalamakia, is halfway down on your starboard side. Kalamakia is a quiet fishing village with a population of just 66 people which has some amazing fish restaurants along the waterfront, a small beach, and a pretty view overlooking the channel to nearby Peristera. If you’ve not yet fallen in love with the Sporades, then perhaps today will be the day. We’re not going on a long sail, but take a look around you and be sure to enjoy the views and the peace and quiet of the islands in the sunshine. We’re actually sailing to two places today as we bimble around the Alonissos national marine park. Firstly, sailing East to the small bay on the South side of the top half of the island of Peristera (that will make sense to you when you get the charts out), which is the island you’ll have been able to see from Kalamakia. Peristera is like a nature reserve. It’s completely uninhabited (save for a few shepherds who tend to their flock every once in a while), and overrun with wildlife. The bay you’re in should have monk seals swimming and flopping around, plus plenty of birds (look out for Falcons), sea-turtles and it’s possible to spot dolphins in the Alonissos national marine park (if you haven’t already). The island is also famous for an ancient shipwreck that was found opposite the town of Steni Vela which dates back to 500 BC – it’s an ancient Greek cargo ship which was heading to Skopelos with 1,500 vases of wine from Halkidiki. You need scuba gear to see it properly, but it’s only 30m below, and the crystal-clear waters mean you can spot something down there. From Peristera, we’re heading to the picture-postcard Patitiri, further south-west down the coast of Alonissos. The prevailing wind should be behind you as you run with the wind down the straight, and it’s only a short sail away. You’ll find the pretty town of Patitiri nestled in between the pine trees. It’s a relatively modern village that was only built in 1965 – people moved here after a nearby town was destroyed in an earthquake. It’s a delightful place to sit, reflect and people watch, and the people here don’t seem to have a care in the world. As well as a few Tavernas, there’s a couple of bakeries and a mini-market, and a small beach. The marina tends to fill up quickly in peak season, but you can also anchor in the south side of the bay. Oh no – the last day! Hopefully you’ve had a brilliant holiday enjoying the sunshine, sailing, and the scenery – the Sporades really are a special place to sail. Hopefully all the crew have behaved themselves and you’ll be leaving Greece with more or even better friends than you arrived with – which is always the sign of a good holiday. Over the past few days we’ve gone from an uninhabited island to a small village (Kalamakia) to a big village (Patitiri) and now it’s time to return to the sights and sounds of a town (Skiathos). Skiathos is obviously still a world away from being a big city, but it will feel big and busy after the last few days, and you won’t be able to believe the constant noise. From Patitiri the journey is a simple hop around the South side of Skopelos island, and up to Skiathos. You could also go to Skopelos and over the northern side of it, but going around on the south side of the island means that we’ll have completed a circumnavigation of all four of the main islands we have visited on this itinerary, and seen all there is to see on each island. The first half of the leg will see you running with the prevailing wind (bonus points for throwing in a goose-wing, by the way), before reaching across the wind to Skiathos when you get beyond Skopelos island. Work your way back into the marina, returning the yacht to the vague area you picked her up from, make the lines good, shut down the engines, and we’re done. High-five the rest of the crew for doing a great job! 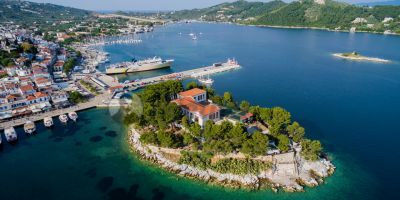 There’s no fuel berth in Skiathos marina – usually a mobile tanker will come around at some point, but check how your charter operator would like you to refuel. Someone will come along and inspect the boat (often with a diver to look at the hull), but you’ll still be able to sleep on-board tonight, before checking-out and returning to dry land proper in the morning. If you’ve not had chance to explore Skiathos then now is the time to get out there. It’s a lively place to be all week, but Fridays are particularly boisterous affairs as a lot of the package operators (both for sailing and for beach holidays) have changeover day on Saturday, so this will be a lot of people’s last night. Have a safe trip home, thanks for the memories, and we’ll count on you to be at PlainSailing.com soon – to start to plan your next great adventure! Skiathos is a major tourist destination because it has exceptional weather, so it should be no surprise to you that it’s hot and sunny throughout much of the year. Even in winter, the island is covered in sunshine, but temperatures drop to around ten degrees. Things really get interesting from April to November - when average temperatures of over 15 degrees mean that it’s safe to wander around in shorts and t-shirts - and the tourists start to flock here when the temperatures hit above 20 degrees from June to September. Thankfully, whilst the mercury rises in July and August (and at mid-day, it can easily reach the low thirties), the temperatures in Skiathos never tend to get overbearingly hot – which is good news for people who like to sunbathe, as you won’t need to take time out during the day in seek of shade (though obviously, be careful, as it’s still very possible to get sunburnt). 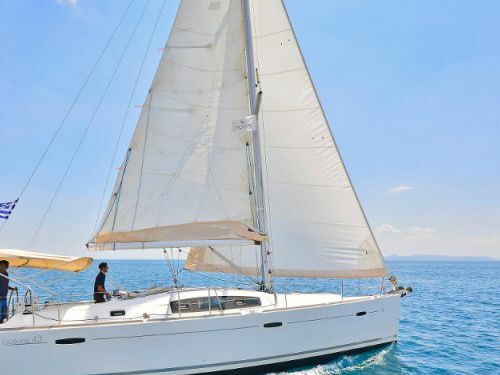 The climate is certainly perfect for sailing, when a bit of breeze from the wind can help to take the temperature down a few degrees, or you can take a dip in the sea to cool down. The sea near Skiathos rarely falls below 15 degrees Celsius, which means it’s bearable to swim in all year round – and, indeed, that's warmer than the sea in some parts of Northern Europe ever get all year-round. 15 degrees will still feel a little fresh though, and the sea is most pleasant at more than 20 degrees, when you start to lose the shock value of jumping in the sea, but it’s still pretty refreshing. The sea is above 20 degrees from May to October, so Skiathos is a good place to head in the off-season, when you’ll get lower prices, but still be able to enjoy jumping into the Aegean off the back of your boat. The sea temperatures peak in August at around 25 degrees, which is about the same temperature as a swimming pool. For chunks of the day, the sea will actually be warmer than the air above it. The Sporades islands are an interesting and exhilarating place to sail. Obviously, there’s the natural beauty of all the islands, the cuteness of the charming towns and villages, and the warm temperatures and sunshine – but it’s also an challenging place for the sailing, and you’ll need to have your wits about you and to check the weather forecast here more than in the rest of Greece. The prevailing winds arrive from the North-east, with a fairly reliable Force 3 to 4 throughout the season, but things get more interesting when the hot summer Meltemi winds start to kick in – these are strong seasonal summer winds which can arrive from the North or North-west in late June, July and August. The Meltemi winds tend to arrive for 2-3 days at a time, and when they do arrive, they can be anywhere from Force 5 to Force 8 (hence needing to check the weather before heading out – don’t just assume it will be a perfect day for sailing if you don’t appreciate this sort of drama!). They're strongest in August. There’s not really any such thing as prevailing winds in winter, and weather systems are as likely to arrive from the tropical regions to the South of the Med as they are from the cold mountain passes to the North. But the temperature is still warm, and sailing can still be pleasant. What is the Current Weather in Skiathos? Skiathos is a major tourist destination in Greece. Land-lubbers come here for ‘fly and flop’ holidays – they land at the local airport, then spend the week relaxing doing practically nothing - but doing it in the glorious sunshine, either by the pool or on one of the island's 75+ incredible beaches with crystal clear turquoise water (including the third best in the whole of the Mediterranean at Koukounaries), and surrounded by the beauty of the largely unspoilt island. The main activities on Skiathos would almost certainly be relaxing, having fun, enjoying the sunshine, and spending time on the beach. There's beautiful beaches galore around the island - Koukounaries beach in the South and Lalaria beach in the North are the most popular. As well as relaxing on the beach, there’s the usual array of beach toys (banana boats, jet-skis) to occupy and entertain the masses, or the ruins of a 16th century castle (the Kastro) or a number of churches and monasteries if you have a thirst for culture. If you’re after activity and adventure, then scuba diving is popular here (and there are things to see below the water-line) and there’s also a number of walking trails inland or around the island. After a hard day of relaxing, the tourists hit the streets for the evenings and create a lively atmosphere in the tavernas, restaurants, bars and nightclubs right across the island. Everything is well organised, and there’s such a positive buzz about the place that Skiathos is practically guaranteed to put a smile on your face, regardless of whether you’re here to party or just to relax. As there’s plenty of tourists to cater for, there’s always a lot going on in Skiathos – with live rock, pop or local folk music on offer every night of the week, plus regular beach parties, and demonstrations of local traditions – put simply, the stuff that other destinations have on offer once a year, Skiathos offers all summer long. During July and August, there’s all sorts of organised cultural performances, lectures and demonstrations as part of the Bourtzi festival (on Bourtzi island, near Skaithos Town). They also showcase local cuisine. As far as big events go, the biggest tend to have a religious focus: for Easter the place is crazy (like the rest of Greece); on April 23rd there’s horse races (and whole load of local pomp and ceremony to celebrate the famous knight, St George; and on July 25th, the whole island takes to the streets for a parade through Skiathos town and share local delicacies to celebrate Saint Paraskevi. More poignant (and less fun) is the Katsonia festival on the 6th of September, which sees locals throwing wreaths and flowers into the sea to commemorate the sinking of a Greek submarine (by a German submarine), which took place near Skiathos in 1943. There’s also an International Piano festival in September for fans of classical music, and until 2016, there was an annual Gay festival, and there is talk of reviving it. Nikos Restaurant – Our favourite place to sample the local cuisine, with memorable food, generous servings, and cheap prices. Is there a finer Greek meal than a Greek salad followed by a delicious Gyros? I don’t think so! 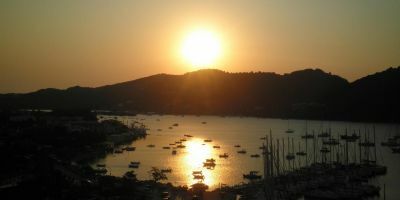 Located just inland from the marina (8 Papadiamantis Street, Skiathos Town). Fregio Ice Cream – this place serves the best freshly made ice cream in Skaithos, if not the whole of the Sporades! It’s between the marina and the old town, there’s loads of flavours to choose from, and the waffles are amazing too. Be prepared to queue, but they’re worth it. (Paraliakos, Skiathos Town). Rock ‘n’ Roll bar – Under a big tree, and overlooking the sea, this bar has live Rock ‘n’ roll to keep the punters occupied on weekends (or every day during the peak season). The bar claims to have won an international award for being the best bar in Europe in 2004, and we’re not surprised (Old Port, Skiathos). Apothiki / Apotheke – Arguably the best nightclub in the old town, this is where people tend to end up late in the night - most locals don’t even think about heading out until after midnight. The main DJ has been on the club scene in Skiathos for years and knows how to get things moving (Mpoumpoulinas 5, Skiathos). Phedrock – A live music/sports bar which specialises in Motown and Northern Soul music during the evenings, and which has loads of screens for watching sports during the day. The perfect place to watch the football, or to get jiggy with it (Miaouli, Skiathos). Danny & Zoe’s Blind Dog – this bar got so popular that it has now switched venues to somewhere bigger. Aside from great drinks, the main USP of this place is that the two owners (Danny & Zoe) are also talented musicians and perform live every night (and are actually quite good!). They take requests, so get thinking! (Papadiamanti | Evaggelistrias corner, Skiathos). Café Bourtzi – not so much a party venue, but this place is based on the little island that juts out to sea and has fantastic views back to the old town, out to sea, and across to the marina – so well worth stopping by for a quick drink (Old port, Skiathos). Babis Hotel ** – c. £35 for a double room – A hotel run by a brilliantly friendly family, who will pick you up from the airport free of charge and put you up in their basic but clean hotel for possibly the cheapest price in town. Better yet, there’s a rooftop terrace with amazing views of the old town and looking out to sea. 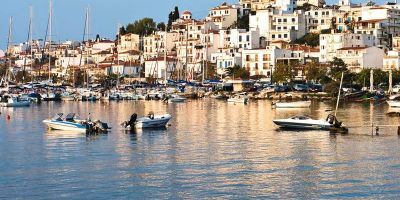 Skiathos Somnia - c. £50 for a double room – The hotel closest to the marina, from this hotel you should almost certainly be able to smell the sea air. There’s views over the marina and you’re near the beach and sea-front bars and restaurants, but they also have a swimming pool and pool-bar to loiter around in the sunshine, and kitchenettes in all rooms. Skiathos Luxury Living **** - c. £125 for a double room suite – A range of stylish and spacious four-star suites, some with balconies with breath-taking views over the Aegean. There’s also an elegant swimming pool and terraced area for relaxing in the sunshine, and this place is located within a 400m walk of the marina. 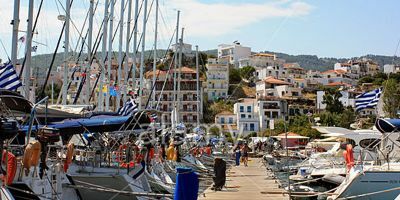 Skiathos marina is located just five minutes walk away from the old town of Skiathos, which is a popular tourist town offering everything a sailor could wish for: places to pick up supplies, a myriad of bars and restaurants, and lively nightlife. The marina is reasonably modern and has space for 350 boats, all with electricity, water, fuel and wifi. Being located centrally, you’re also not far from banks, restaurants, supermarkets and laundry services. Skiathos island is a very popular tourist destination, and welcomes thousands of people during the summer. You can arrive by sea (from Athens or Volos), but it’s easiest to arrive at the local airport, which receives aeroplanes from right across Europe. The airport is only 3km from Skiathos town (and the marina), so getting to your yacht or catamaran is super easy. We can arrange transfers for you (just ask), or you can just grab a local taxi for the circa five minute journey. There are also local buses which go via the airport, but they don’t have a fixed timetable, and they’re infrequent because it’s so easy to get there by taxi. If you can’t afford the taxi, then it’s possible to walk the 3km to town (if you don’t have too many bags).